On 8th June 1978, Intel launched their first x86 processor. To mark the 40th anniversary of this momentous day, Intel have produced the special edition Core i7-8086K. This is a limited edition CPU, Intel are producing no more and as such once our stock has sold out you will have missed your opportunity to own this truly legenday product. Not merely a symbolic gesture, the 8086k is at the pinnacle of CPU engineering. It features 6 cores and 12 threads and, being a compatible K-edition, it will automatically overclock from its already impressive base clock of 4GHz to 5GHz. This processor is available in limited quantities so will only be available for purchase for a short time. Get it while stocks last! 6 physical cores, 12 logical cores thanks to SMT! Only compatible with motherboards utilising Intel's 300- series chipsets! To mark the fortieth anniversary of the initial x86 chip's release, Intel have made a special edition core i7 chip. It bears the name i7-8086k in homage to the original and is boxed in special edition packaging. As with all Intel's k-series CPUs the i7-8086k natively supports overclocking. The latest 8086K anniversary CPU has a base clock of 4.0Ghz and, thanks to Turbo Boost 2.0 technology, this rises up toa blazing 5.0Ghz. This makes it one of the fastest stock consumer CPU's ever released by Intel. 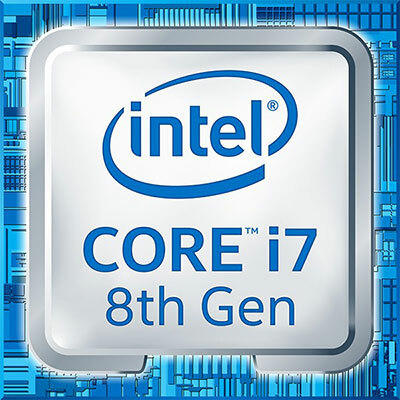 The i7-8086K's L3 Cache has been increased to 12 Megabytes and it features six CPU cores as well as Hyper-Threading. As a result 12 threads rather than just 6 can be processed simultaneously and all at a low TDP of just 95 Watts. The integrated GPU has been similarly optimised. With 24 Execution Units, it offers plenty of graphics processing power for Intel Quick Sync, intense computational tasks and of course a gaming. Additionally, the GPU supports DirectX 12 with Feature Level 12_1, OpenGL 4.5 and OpenCL 2.0 as well as 4K, UHD- resolutions at 60 Hz via Displayport - provided the processor is paired with a compatible motherboard. As for memory, the 4-core processors support speeds up to 2.400 MHz, while six-core processors support up to 2.666 MHz. Please note that the i7-8086 is compatible only with the 300- series chipset, it cannot be used with older chipsets. The boxed version also comes without a CPU cooler. More links for "Core I7-8086K 4.00GHz (Coffee Lake) Socket LGA1151 40th Anniversary Processor - Retail"
Went from an LGA1366 with a x5660 to this.. WOW.. Noticeable difference, don't let people tell you other wise, huge difference on games and everyday usage, have had LGA1366 since launch with a i7 920 D0 at 4.2ghz and the x5660 for 2 years again at 4.2ghz. The x8086 boosts to 5 out of the box but currently have mine (all cores) siting at 4.8ghz at lower volts. Good overclocking fun too!! Upgraded to 8086k from 6700k and the difference is remarkable. Straight out of the box it boosts to 5.0 GHz as it should, but with OC will hapily sit at 5.0 GHz on all cores with vcore set to 1.25v. Yes i recommend this CPU, for gamers, for content creators, and those who want to own the fastest desktop cpu right now.